This MTV movie starring Ethan Hawke and Uma Thurman looks cheap, feels cheap and it is cheap. However, it’s amazing what good script can do. Story is set in one hotel room where two old friends discuss their lives and personalities and this eventually leads them to some pretty unexpected events. 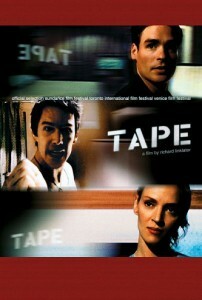 Tape can be considered a slow movie, but once it gets you, it does not let you go. 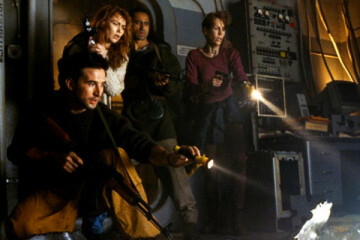 One of those cool underground flicks with excellent performances and pretty solid scripts. I especially liked that the movie is set in one room, so it’s just the actors and the script there, kind of raw movie experience, and they managed to make it interesting. It’s also interesting to think about the types of characters present here. We have a subversive element represented by Vince, a drug dealer who likes to get high off his own supply and official guy Jon. Not to mention one hot female. As you probably guessed, Tape is based on a play written by Stephen Belber. You will immediately notice that the dialogue is realistic and engaging, slowly pulling you in. When you don’t have the luxury of many sets or action sequences, you have to be very careful with the script and your characters. Belber excels at this and Linklater was able to transform this play into a very engaging movie, making Tape into something that should be watched in film schools as an example of a very cheap and effective movie. Linklater also directed some of my favorite movies like Dazed and Confused, The School of Rock, A Scanner Darkly and Bernie. Speaking of simple and effective movies, I simply have to recommend Danish masterpiece Festen. This movie was shot by the Dogme 95 rules, and if you want to know more about the movement, I will leave the link after the review. Fun Stuff: The set could not contain a working toilet, so when Vince flushes his drugs there is a cut to a “real” toilet – distinguishable by its slightly bluish water.